Raul A. Reyes is an attorney and member of the USA Today board of contributors. Follow him on Twitter @RaulAReyes. The opinions expressed in this commentary are solely those of the author. (CNN) On Saturday, thousands gathered in El Salvador to celebrate a jubilant moment in their country’s history. In a special ceremony held in the capital city of San Salvador, former Archbishop Oscar Romero was beatified, putting him one step closer to sainthood. It is unfortunate that many Americans have probably never heard of Romero. Like Mahatma Gandhi and Rev. Martin Luther King Jr., he was a believer in nonviolence and the innate dignity of all people. Sadly, just like Gandhi and King, Romero died a violent death. A champion of the poor, Romero was shot and killed while celebrating Mass in a hospital chapel 35 years ago. He was 62. The beatification of Romero is welcome news for El Salvador, Latin America and the Roman Catholic Church. It is overdue recognition of a humble man who was not afraid to speak out on behalf of oppressed people. 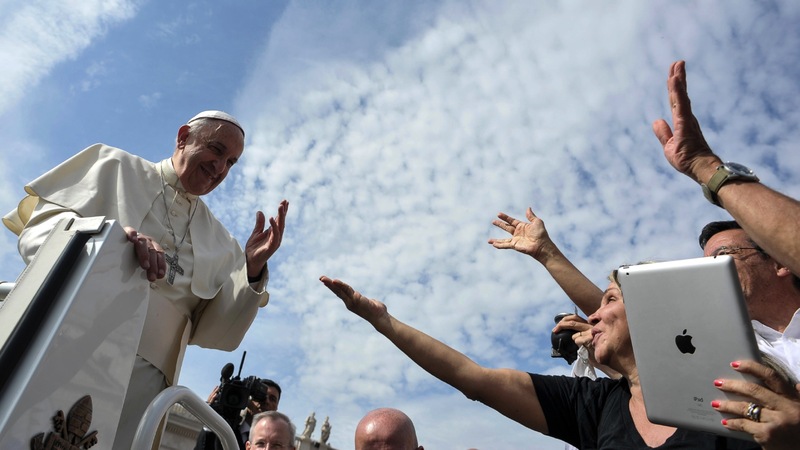 Plus, it is further evidence of Pope Francis’ commitment to reforming the church. Romero was an unlikely social crusader. He had a middle-class upbringing and was regarded as conservative when he became archbishop. But after a Jesuit colleague was killed by a death squad in 1977, Romero became outspoken against the country’s repressive regime. He often ended his homilies, which were broadcast on the radio, with a recitation of the week’s disappearances, decapitations and murders. One month before he was killed, Romero wrote to then-President Jimmy Carter and asked him to stop supporting El Salvador’s government. On the day before he was killed, he appealed to Salvadoran soldiers to stop killing their fellow citizens. Such acts led the political establishment to unfairly label Romero as a revolutionary and a radical. Then on March 24, 1980, he was murdered. His death helped propel the country into a civil war that lasted for 12 years and claimed the lives of over 75,000 civilians. Now Romero’s beatification serves as a rebuke to charges by El Salvador’s elites that that he was a subversive, a communist or a Marxist. Romero was none of these things. He was a man who lived his conscience by speaking out against injustice. His impassioned calls for peace are still relevant in the age of ISIS and Boko Haram. And his activism could serve as an inspiration to people of all faiths who are fighting for human rights, whether they are in Central America, Ferguson or Baltimore. The fact that Pope Francis facilitated Romero’s beatification is notable. In the Roman Catholic Church, a person was traditionally declared a martyr if they died for refusing to renounce their faith. But earlier this year, Francis declared Romero a martyr for dying “in hatred of the faith.” The Pope said, in effect, that a person could become a martyr for dying because of others’ hatred for their Gospel-inspired work. This move cements Romero’s legacy as a spiritual — rather than political — figure. Romero’s beatification also reflects Francis’ interest in creating “a church that is poor and for the poor.” Consider that he has revived interest in “liberation theology,” a Latin American movement that places special emphasis on serving the poor. Or that the beatification process has started for Latin Americans such as Father Rutilio Grande, whose killing inspired Romero’s social justice work, and Bishop Enrique Angelelli, who died in a suspicious car crash in Argentina. Pope Francis has brought the Vatican Bank back to life. Profits have skyrocketed at the overseer of the Vatican’s vast finances, as the holy bank recovers from a series of financial scandals that spurred a complete overhaul of the bank. Formally known as the Institute for the Works of Religion, the bank oversees more than €6 billion ($6.5 billion) of assets from Catholic institutions, employees and pensioners of the Vatican, and other purveyors of charitable works. It said Monday (May 25) its net profit shot up to €69 million ($76 million) in 2014 from just €2.9 million ($3.2 million) the year before. The profits mark a turning point for the beleaguered bank. When Pope Francis took over leadership of the bank (which is run by 6 cardinals and other governing board members that report to the Pope), it was beset by a series of scandals that included money laundering, fraud, and criminal activity involving major Italian companies, and resulted in the resignation of the bank’s director and other top officials. While many Vatican leaders have attempted to right the financial ship over the years, Francis has proved the most aggressive. Under his leadership, the bank has restructured the financial office. It named new directors and began implementing new international accounting standards. It tightened criteria around who could use the bank, shutting down shady accounts and screening the people it served to comply with global anti-money laundering policies. While the Pope finally seems to be getting the Vatican’s financial house in order, it’ll be up to his holiness to keep the efforts toward more accountability, honesty, and transparency in high gear. “The gospel of Luke says: ‘He wept bitterly.’ That earlier enthusiasm about following Jesus had turned to grief, because he had sinned: He denied that he knew Jesus.That look (by Jesus) changed Peter’s heart, more than before. The first change was being given a new name and a new vocation. “We too can reflect: what look is Jesus giving me today? How is Jesus looking at me? With a call? With a pardon? With a mission? But on the path He created, all of us are being looked at by Jesus. Pope Francis has met Palestinian President Mahmoud Abbas at the Vatican, calling him “an angel of peace”. The Pope made the remark as he presented the Palestinian leader with a medallion. President Abbas is visiting the Vatican for the canonisation of two 19th-Century Palestinian nuns on Sunday. 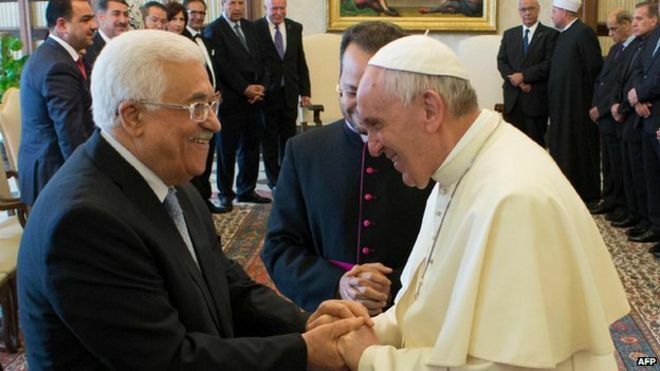 His visit came days after the Vatican said it would formally recognise Palestinian statehood in a treaty. The treaty states that the Holy See favours a two-state solution to the conflict with Israel and allows the Vatican to oversee aspects of Roman Catholic life in the areas President Abbas controls. Correspondents say the Vatican is keen to protect the property and civil rights of the Catholic Church in the Palestinian territories. The Vatican’s move also comes amid growing momentum to recognise Palestinian statehood. Over the past year the European Parliament as well as the UK, Republic of Ireland, Spain and France have all passed non-binding motions in favour. Sweden has gone further, officially recognising Palestine as a state.